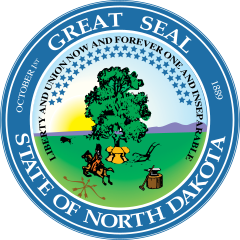 North Dakota lies at the very northern center of the United States, bordered by Canada, Minnesota, South Dakota, and Montana. It has some of the most extreme weather in the U.S., with temperatures as low as -60 degrees Fahrenheit and as high as 121 degrees Fahrenheit recorded. 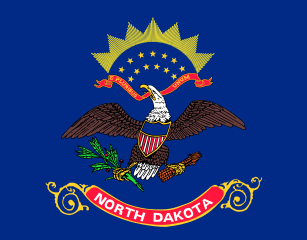 North Dakota played an important role in Lewis and Clark’s expedition. The company wintered in a Mandan village in 1804-05, where they met Sacagawea, a teenager who had been kidnapped from her Shoshone tribe. The young woman accompanied the expedition as a guide and translator, and proved to be among the most valuable members of the party. A reservoir in North Dakota is named in her honor. People have lived here for at least 10,000 years. The Mandan, Dakota, Hidatsa, and Cheyenne Nations all lived here; today, at least 30,000 Native Americans still reside in North Dakota. North Dakota grows more flaxseed, canola, sunflowers, and barley than any other state, as well as large amounts of beef cattle, soybeans, and wheat. Bison, moose, elk, pronghorn antelope, and bighorn sheep all live in North Dakota. President Theodore Roosevelt lived and ranched in North Dakota. His cabin still stands there. Answer: A peace garden, created in 1932, lies at the Canadian border. The garden represents a promise between the U.S. and Canada never to go to war with one another. Watch a video about North Dakota. Declan, Tobin. " North Dakota Facts for Kids ." Easy Science for Kids, Apr 2019. Web. 25 Apr 2019. < https://easyscienceforkids.com/north-dakota/ >.